Champion, a globally recognized industry leader in specialty lubricants, has teamed up with SS Sales & Marketing Group, specialty automotive aftermarket representatives, to increase product coverage in California, Arizona, Nevada, New Mexico, Idaho, Montana, Utah, Wyoming, Colorado, Alaska, Hawaii, Oregon and Washington. 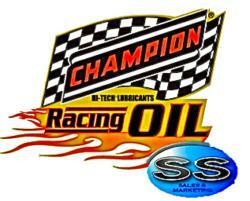 Champion Oil is More Competitive with SS Sales & Marketing Group in the Western United States. Champion Oil develops synthetic motor oils for the racing, diesel, classic, vintage, hot rod, muscle car, and the engine builder markets. They manufacture numerous multi-viscosity motor oils with high zinc and phosphorous formulas designed to deliver the correct balance of chemistry to protect vintage and high performance engines, especially those using flat tappet roller cams operating at high RPM's and requiring high-pressure valve springs.